CLIPSO® profiles are high-tech and specially-designed to work in conjunction with CLIPSO coverings. They can adapt to any design need, from simple ceilings and walls to intricate designs and complex shapes. They can integrate existing fixtures and adapt to any style, whether modern or classic. For varying finished looks and installation needs, CLIPSO profiles are available in 3 different materials: aluminum, ABS and PVC. Each CLIPSO profile is specifically-designed for varying applications. CLIPSO profiles can be mounted to all wood-based supports, thus allowing them to adapt to various shapes and existing architecture. They may be stapled, screwed or glued to the substrate. Many profiles offer a small reveal, making them ideal for high-profile areas by presenting a clean, finished look. 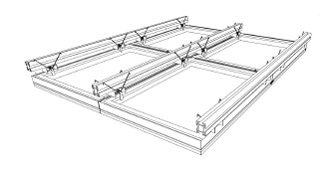 When access to plenum is required, the AEROCEILING® Torsion Spring System is the solution. Functioning with a system of brackets, torsion springs, and clips, this system allows accessibility when needed.